Another Michigan State Championships Report! Hello everyone in Omar Nation! This is Joel here with a report on the Michigan State Championships that took place over the weekend in Lansing, Michigan. Before I go on any further with my report, I’d like to thank Pikkdogs and the rest of the Team Omar staff for i nviting me to write for you guys. Here is a little bit about myself, I have been playing since the Base Set, took a hiatus when the first e-reader set came out, then got back into the game around Diamond and Pearl. But enough about me, let’s go on with the article! I decided to run Luxchomp for this event because that was the deck I felt most comfortable with. Luxchomp has an excellent track record and hasn’t really disappointed me. I’ll post my deck list at the end of the article. For this event, there were 76 Masters, with 7 rounds and a top 16 cut. My first round match was a mirror. I have never met Marvin before but our pre-game talks give off the impression that he is a really nice guy. The game starts and I go first. I start with an Ambipom G and a Bronzong G on my bench, with a Double Colorless Energy, Energy Gain, and Cyrus in my hand. He has a Garchomp C active, Luxray GL and Dialga G on his bench. I go first and get a quick knockout first turn with Ambipom’s “Snap Attack”. He goes, benches a Crobat G, and uses Flash Bite to drop a damage counter on my Bronzong G, then passes. I draw, and get a Pokemon Collector. I get Uxie, Luxray GL and Crobat G. I drop Crobat, Flash bite his Crobat, attach a lightning energy to Luxray, then Snap Attack his active Luxray for 60. 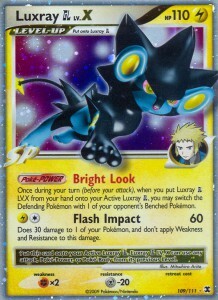 He goes, draws, and attaches to his active Luxray and passes. It seems he didn’t have anything playable in his hand, which is odd because there is usually something playable. I Poke-turn my Ambipom and Crobat, I flash bite his Bronzong, and promote Luxray to Bright Look his Crobat. I bite to get a 2 prize lead. It was after this turn that the game started to go downhill for me. He finally draws a Cyrus which allows him to catch up. I made my terrible misplay here as I played Professor Oak’s New Theory over Cyrus, and end up getting a terrible hand followed by terrible draws. He finally catches up and gets a prize lead over me. As soon as he gets his prize lead, time is called. After realizing that there isn’t much I can do in the next 3 turns, I scoop and get a terrible case of the first round jitters. It was a good game though. Continue reading "Another Michigan State Championships Report!"